Christina Aquila has been writing nutrition-related articles since 2007, contributing to websites such as SuperKids Nutrition. She holds a Master of Science in nutritional science from California State University, Los Angeles, a certificate of training in pediatric and adolescent weight management and is a certified lactation educator. Including whole wheat bread in your diet is an easy way to increase your daily whole-grain intake. Whole grains include the entire grain kernel, which is made up of the bran, germ and endosperm. Whole wheat bread is a rich source of fiber, minerals and is low in fat and cholesterol. According to the USDA Food Guide Pyramid, at least half of your grains per day should be whole grains. Bread comes in a variety of types and names. 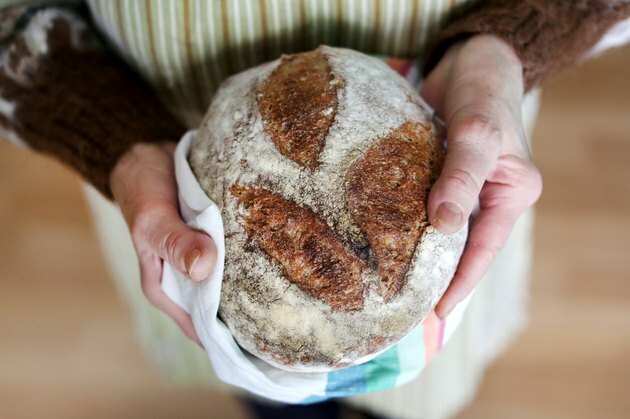 Unfortunately, it isn't always easy to identify a whole-grain bread by its color or name. Brown breads often get their color from molasses, not from whole grains. Breads such as wheat, seven-grain, multigrain and honey wheat may include the wheat grain, but they might not be made with the whole wheat grain. To ensure you are buying whole wheat bread, look for bread with the words "100 percent whole wheat" on the front of the package and a first ingredient that includes the word "whole" such as whole wheat flour, whole oats or whole rye. According to the U.S. Department of Agriculture National Nutrient Database for Standard Reference, one slice of commercially prepared whole grain bread provides 69 calories, 8 of which come from fat. One slice also provides 4 g of protein, 132 mg of sodium, 12 g of carbohydrates and 2 g of sugars. One slice of whole wheat bread provides 2 g of fiber, which is 8 percent of the daily recommendation for a 2,000-calorie diet. The Dietary Guidelines for Americans 2005 recommends a goal of 14 g of dietary fiber for every 1,000 calories. Consuming a diet rich in fiber has been shown to reduce the risk of coronary heart disease, encourage proper bowel function thus reducing constipation, and increase fullness to help with weight management. Whole wheat bread is a good source of iron, which is important for transporting oxygen throughout the body and muscles. Whole wheat bread is also a good source of magnesium and selenium, providing 23 g and 11 g, respectively. Magnesium is important for muscle function as well as for energy production and the production of protein. Selenium is necessary for a healthy immune system and to prevent cell damage. Whole wheat bread is a low-fat and low-cholesterol option. One slice provides about 1 g of fat, none of which is saturated or trans fat. Whole wheat bread also contains no cholesterol. Adding foods low in saturated fat, trans fat and cholesterol to your diet keeps unhealthy LDL cholesterol levels low and reduces the risk of developing coronary heart disease.